My husband, Tony, and I recently combined the formal honeymoon we never had with a private celebration of our 40th wedding anniversary. 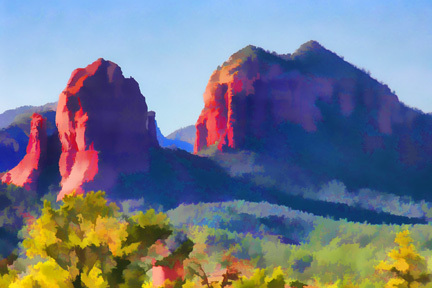 The inspirational red rocks of Sedona, Arizona, provided the perfect backdrop for sharing a lifetime of "remember whens" — the good far outweighing the bad — and affirming our hopes and dreams for the shared tomorrows yet to come. We no longer take for granted good health, nor the freedom it brings to do what we want, when we want on a moment's notice. We have experienced firsthand how quickly good health can be taken from us, so we work at living in the here and now, rather than wasting time and energy preparing for losses we may never know. It is the little losses that cut deepest we found when I became dependent on walking aids that make holding hands virtually impossible. Married over Thanksgiving weekend of our senior year in college, we gave up a honeymoon for final exams, and used this "sacrifice" to justify every subsequent vacation we did take, starting with a spring break road trip to Hot Springs, Arkansas. All I remember is that the toilet in our motel room ran all night. The manager told us we were lucky not to be sleeping in our car, as our room was the last available for 50 miles around. Capping off our trip, we drove back to Chicago during an April Fools Day blizzard. That was a "remember when." Most of the people we met on our belated honeymoon were surprised to learn that we were celebrating our 40th anniversary. They told us we looked far too young, which jived with Tony's memories of only "very, very old" customers buying 40th anniversary plaques from his parents' gift shop. People congratulated us as if we had accomplished a major feat. They wanted to know our secret. I never really gave it much thought. Perhaps it is as simple as heeding my grandmother's guidance to "never go to bed angry." "If you foolishly ignore beauty, you will soon find yourself without it. Your life will be impoverished. But if you invest in beauty, it will remain with you all the days of your life."